To avoid possible damage to the instrument, it is recommended the installation of "The String Butler" to be installed by a professional but can be installed by yourself ( See Youtube Video below). To ensure optimum performance of "The String Butler" a new set of guitar strings should be installed. All "String Butler" models are supplied two PVC washers to protect the finish from scratches (except in the string Butler acrylic "models). These PVC discs are placed over the tuning pins and placed under "The String Butler". Check on the dimensional data in millimeters (mm) required from centre post to centre post. Note for V3 Clear only the maximum string gauge should not exceed .10 -.46 for electric & .12 -.53 for acoustic guitars. Other versions there is no restrictions on string gauge. 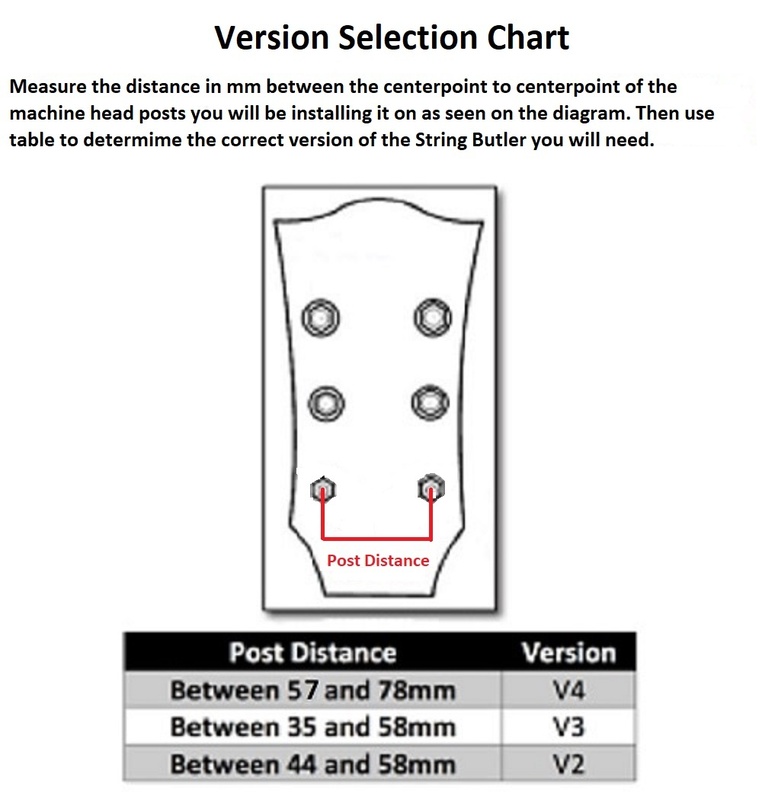 First before buying one of "The String Butler" models, determine whether the mechanics of your guitar are suitable for mounting. 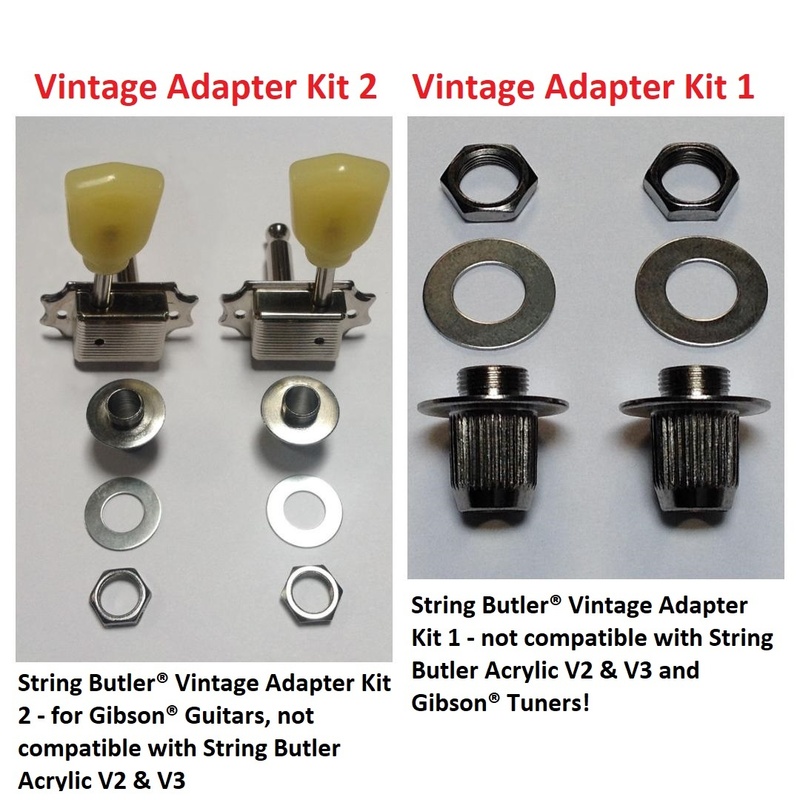 If you have tuners that have tuning head bushings like "Vintage Keystone Tuners" then you need a special retrofit kit which is called String Butler® Vintage Adapter Kit 2 ( for Gibson Guitars * see pictures below) or String Butler® Vintage Adapter Kit 1 ( for all other guitars *see pictures below ). Some locking tuners are also not compatible. 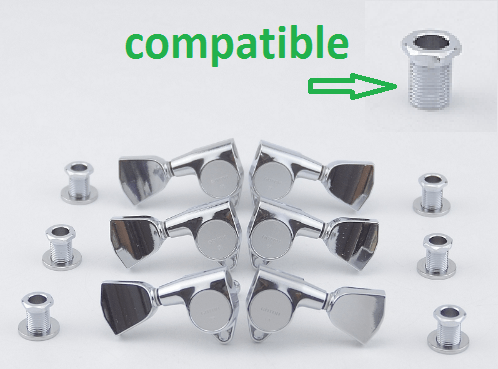 Robot tuners are compatible only with V3 Tremolo versions. Not compatible with SPERZEL tuners! 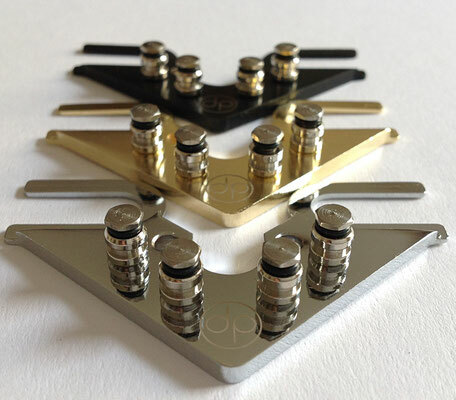 Not compatible with Planet Waves Auto-Trim Tuning Machines by D'Addario! If in doubt check out our guitar database to see if the String Butler is compatible with your guitar at Click Click Here. 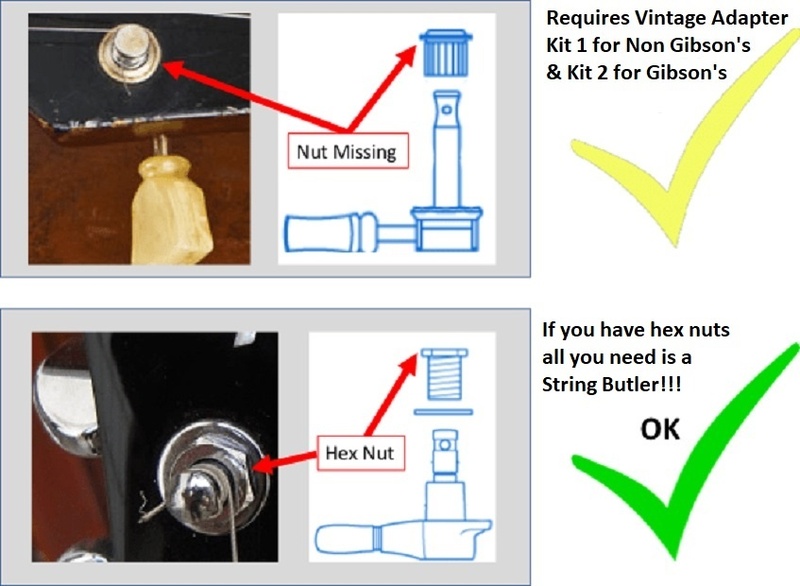 You need tuners that have hex nuts which is needed to hold down "The String Butler". Also locking tuners may not be compatible as many of them are low profile designed whereby the distance from the top of the hex screw to string insertion hole is too little to accommodate the String Butler underneath. The test to see if the String Butler will fit under your locking tuners is to take off the hex nut and put the edge of a Canadian quarter ( aprox 1 mm thick ) underneath the hex screw then screw the hex nut back on. If the hex nut screws back and does not cover the string insertion hole then the String Butler will fit. You can also just put the edge of the quarter on top of the hex nut to see if it covers the string insertion holes. If not then the String Butler is not compatible with your locking tuners. For the V4 the smallest distance between tuner posts centre to centre is 57.0mm to a maximum 78.0mm. For the V3 the smallest distance between tuner posts centre to centre is 35.0mm to a maximum 58.0mm. For the V2 the smallest distance between tuner posts centre to centre is 44.0mm to a maximum 58.0mm. For a musician, there is probably nothing worse than having to play on an out of tune instrument. Many guitarists have this problem when they bend strings. You end up tuning your guitar over and over again or take your chances when playing on stage. 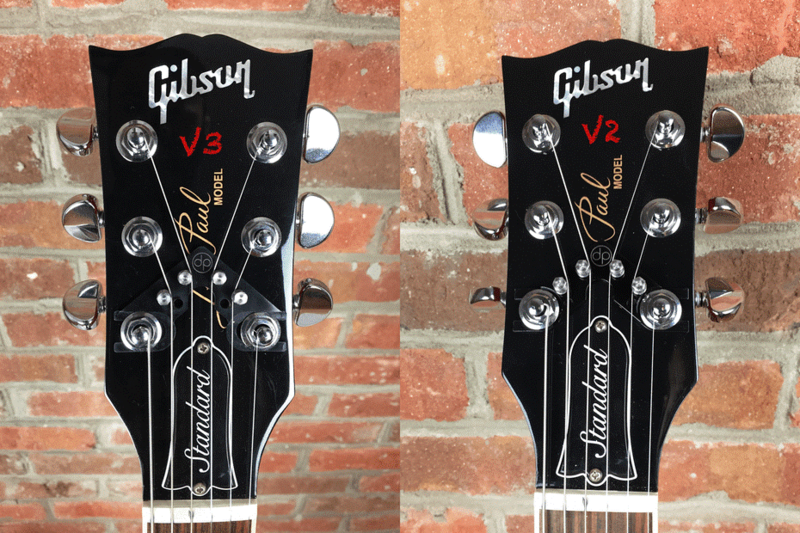 I thought about this problem for a long time and why this effect only appears on certain guitars with 3L / 3R headstocks. With this configuration strings are positioned in high tension/friction arrangement where the string gets kinked behind the nut. Bending a kinked string pulls the kink into the nut where it gets stuck until it’s pulled out again by tuning. If you tune your guitar at this point you can hear a “pling” sound. The “STRING BUTLER” is designed to take the strings out of the nut in a straight line and guides them over a set of rollers into the machine heads. Because of that, the strings cannot kink behind the nut. It does not matter how expensive the machine heads of a guitar are. It is important how the strings move between the nut and the machine heads. The “STRING BUTLER” has been designed exclusively for guitars fitted with a headstock with a 3L / 3R tuning machine head layout. Importantly, the “STRING BUTLER” has been designed for tuning machines fastened with threaded screws. 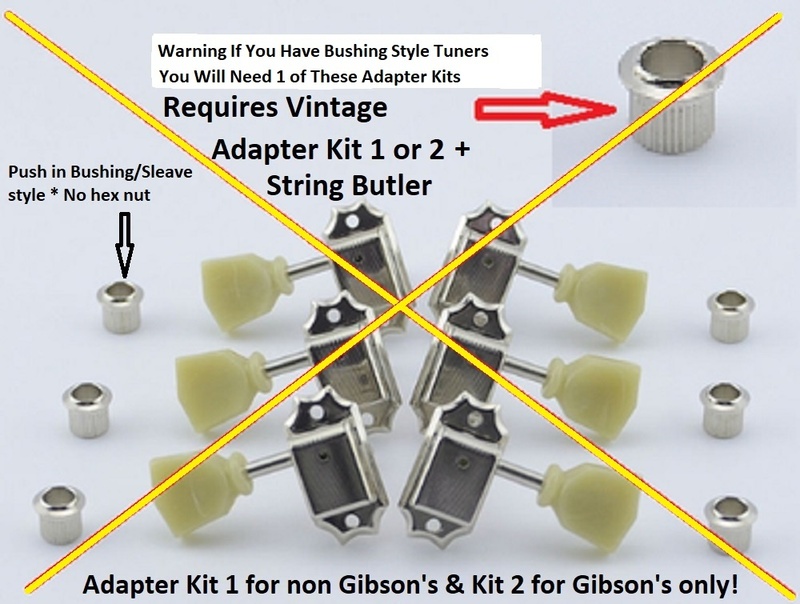 Vintage Keystone style tuners with sleeves to strike are not compatible and some locking tuners. Another advantage of the “STRING BUTLER” is that you can perform the installation yourself. It is recommended that you use a new set of strings after mounting the “STRING BUTLER.” Your old strings may have been damaged already. When assembling the “STRING BUTLER” it is important to clean & lubricate the nut as well. Next, use a 10mm wrench to unscrew the machine heads, a 3/8" wrench may not work. There are tuners that require omitting their washers, but if the pegs are long enough you can continue to use them to secure the “STRING BUTLER.” Be careful not to tighten the thread nuts too firmly to prevent damage. 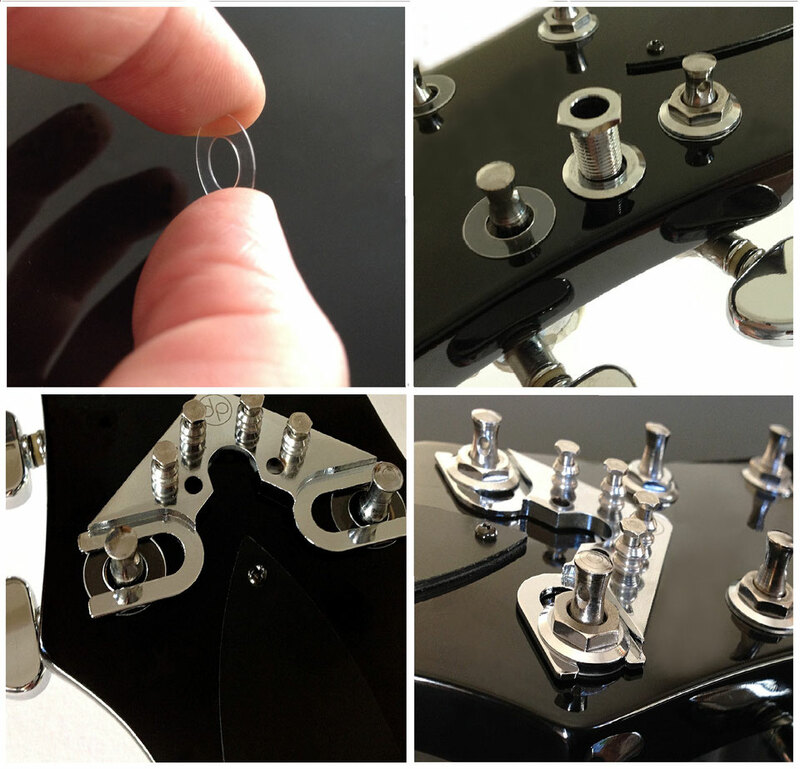 Locking Guitar Machine Heads can not be used when the distance from the head plate to the hole for the insertion of the guitar strings is 19.5 mm or less. Optimal is 21.5 (without flat washer) to 24.0mm (with flat washer) if the head plate is not stronger than 15.0mm.